There is always a best time and place for shopping in Tenerife for special fresh fish on the market. 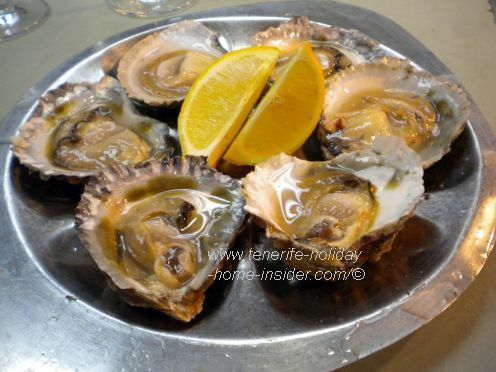 Hence, a holiday home in Tenerife or its rental is ideal for those who love to prepare their own seafood. Shopping in Tenerife at a street stall of a fishmonger in Puerto de la Cruz as an option. Best places to buy fresh fish? Street fishmonger stalls like in Puerto Cruz by the harbor where fish isn't displayed on ice, though. All Mercados i.e. markets of Tenerife towns on the island where traditional fishing is practiced which includes San Christóbal de la Laguna. Best fresh seafood sold in winter and around Christmas. Fresh Oysters at the Santa Cruz municipal Market. Mind that almost any big fish may appear on shop shelves sporadically in between seasons, as well. Shopping in Tenerife for fresh fish from May to September. Fresh Mackerel called Caballa in Spain. Caballas the Mackerel blue fish are amoung the best buys in that season. The Mackarel will help to lower high Cholesterol and is so rich in healthy Omega3s. The Caballa sold then is generally up to 20 cm (about 7inches) big. From June right through summer. Encounter Merluza in those months. 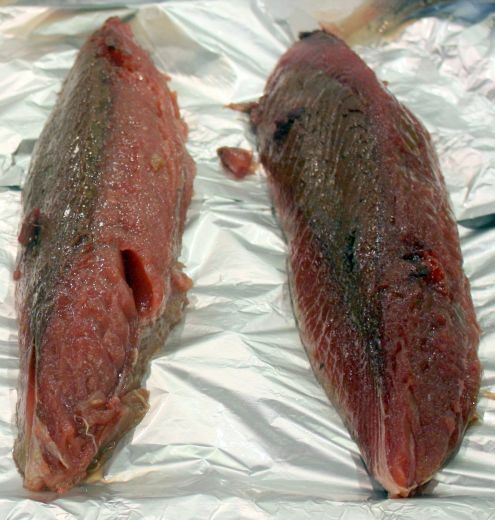 Look for Merluza the prime Hake from around Cadiz or for fish of Northeast Atlantic origin which includes the Bay of Biscay... Good quality Merluza should not be Cariocas the immature fish. 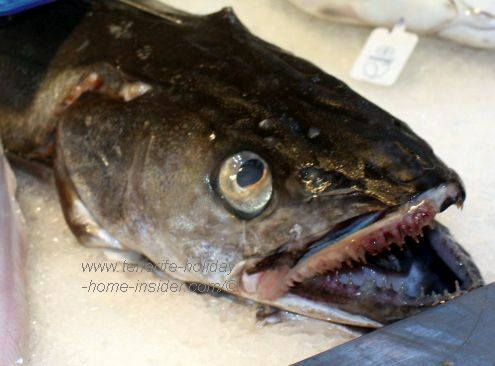 Merluza Hake species from Cadiz in Spain with its awesome top and bottom teeth showing. Mind Mercadona that gives you tags of origin. Note that Bacalao which is also from the Cod family should be much cheaper than Merluza. Bonito season from end of June until September or longer. Bonito Tuna Alistado from Northeast Atlantic by Spain. Bonita Tuna compared to Skipjack Tuna while shopping in Tenerife. The real Tuna fish the Skipjack Tuna always turns pink inside when it's cooked, while a Bonito Tuna will remain white or off white. The Skipjack is a Tuna fish of warm and tropical waters and not of Tenerife or the Atlantic. It is also the one you buy most of the time in tins. Mercadona outlets with different size fish. The municipality of Puerto de la Cruz has several Mercadona shops. Most of their fresh Bonito Tuna is sold as entire fish. Stocks left on shelves may vary of course. Hence, a 10 kg Bonito may be too big for you to purchase. A Bonito fish bought as one piece of 3,45kg for about Euro 10 at Mercadona Realejos. The price was Euro 2,95 per kg on August 26 of 2017. This delicious fresh fish was microwaved on full for 20 minutes. Bones were removed and junks of it were placed in a home made fish curry marinade made with olive oil in a closed plastic container to avoid freezing. Important is that oil covers well. The price of cut up fish. Any fish that's cut in portions will not be cheap. The Bonito "Tuna" isn't an exception with shopping in Tenerife. However, the quality of this seafood may be priceless to lovers of fresh seafood, although it's not the top or real Tuna. Fishermen never mention if they caught a male or female fish. Otherwise, there are almost as many varieties of species of Bonito Fish as there are types of Papas Bonitas Potatoes. There is always one you will favor. Local fishermen of Spain think that the Bonito del Norte (Thunnus alalunga) is the best. It usually leaves the Portuguese Azores in Spring to be in Cantabria Spain in Summer. It doesn't cross the Atlantic as far as Mexico like other Bonito fish. 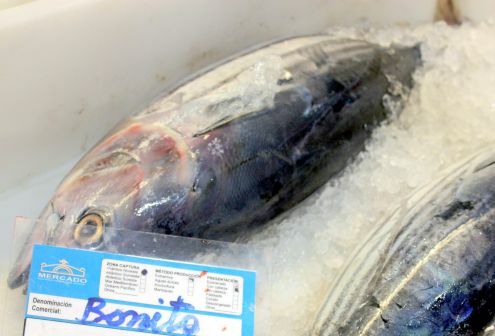 Where get the Bonito del Norte Tuna in Tenerife? Carrefour would be your best bet so I was told. Otherwise, the Municipal Market in La Laguna. 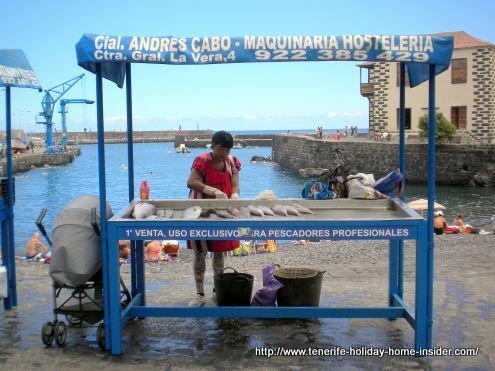 Fresh fish on offer in Tenerife around July. Prime Sardines during Puerto Cruz Fiestas de Julio July celebrations or Fiesta del Carmen. The event is called Sardinada con Salsa where folk dress is required. From shopping in Tenerife related to fish seasons back to its main article about shopping on the biggest Canary Island in general. Ten interesting questions about the Bonito fish may be found in Spanish at Web Mercadocalabajio.com.